*this is a sponsored post, the pattern was provided by Gracious Threads. This post contains affiliate links. See my disclose policy here. I have to say I love the pattern! What made me offer to review is the fact that it’s a simple everyday piece of clothing made from knits. I just love knit fabric and could literally make tons of those tees for both my kids. I decided to make a boys version from it just to see how it would look. I know the shape of the tee is feminine but it could be altered a tad to make it look more masculin. For little boys it would definitely work. My son is 10 so I REALLY took a chance here but what a good sport he was and he even modeled it for. I used a t-shirt instead of yardage fabric. I liked the logo and thought it was perfect for my son. cut the sides open and cut around the armholes and neckline so you will be left with the inside of the t-shirt. Repeat for the backside. fold the cut out t-shirt piece over sideways and place your template onto the fold line as you would instructed in the tutorial. If you are lucky you can even keep the original bottom hem in place! Pin in place and cut around it. now you have your cut tee front. Repeat with the back side so you will have a front and a back tee piece. 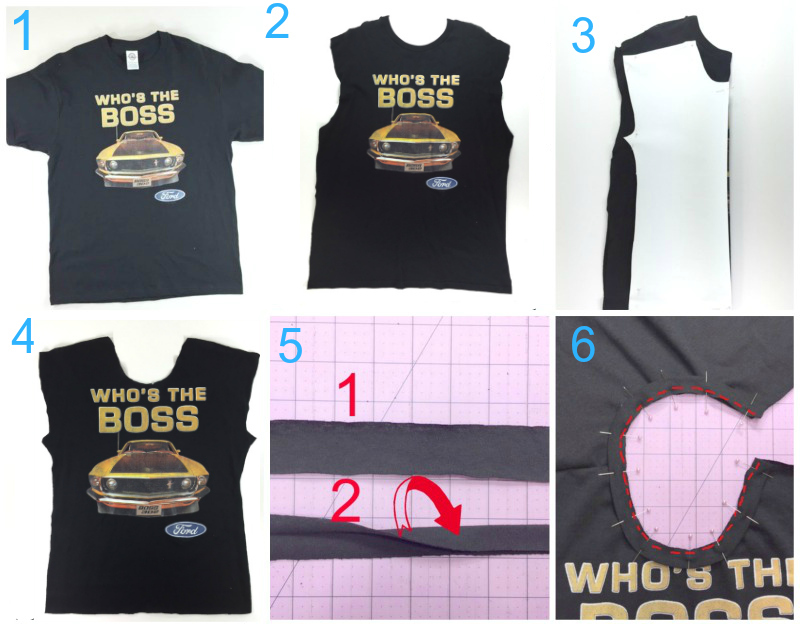 Proceed with the tutorial to assemble the tee until you reach the step to add the neckline elastic. to make the binding neckline versus using elastic, measure the neckline and cut a piece of knit fabric (I had enough from my t-shirt) about 1.5-2″ shorter than what the neckline measures and 1.5″ wide. Cut two more strips for the armholes in the same fashion. Now fold over the strip lengthwise and press. Right sides out. pin new binding strip onto the neckline aligning all cut edges. Sew binding on using a stretch or slight zigzag stitch. You can also serge/sew it on. Then follow through with the tutorial until you have your finished project done! Is AWESOME!!! My fun and sweet boy put it on right away and thought it was the coolest tee ever!! 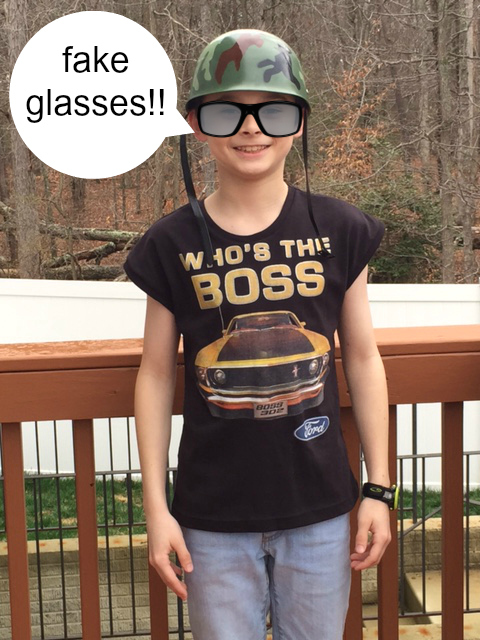 Ok so we allowed ourselves some fun and I photoshopped some fake glasses on him to go with the hilarious plastic camouflage helmet he insisted to wear. 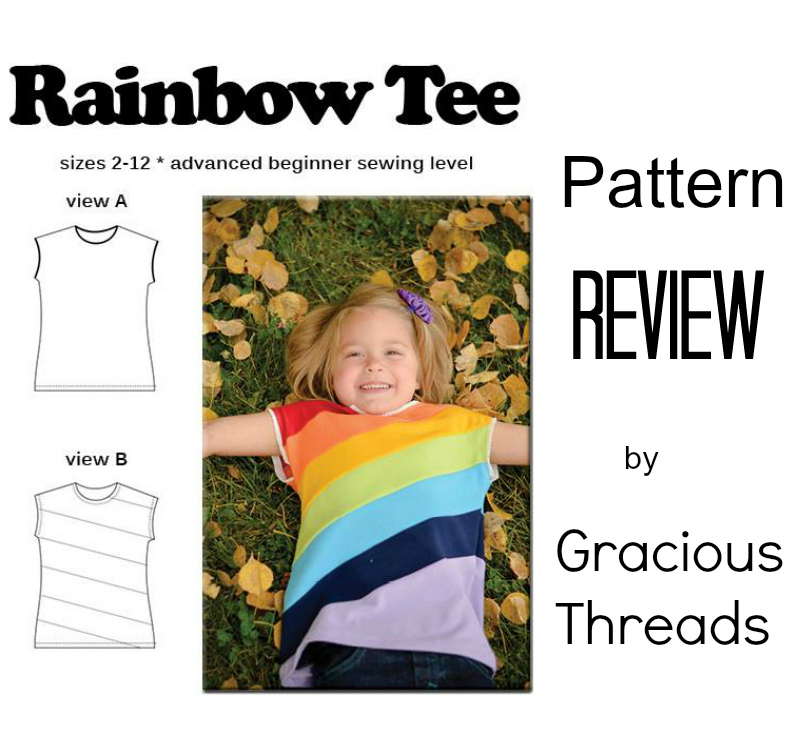 Check out Gracious Threads pattern shop for more great sewing patterns! This is so much fun! Thank you for the great tutorial. Thank you for letting me review this awesome pattern!!! I am sure there will be many more Rainbow Tee’s in my kids future!